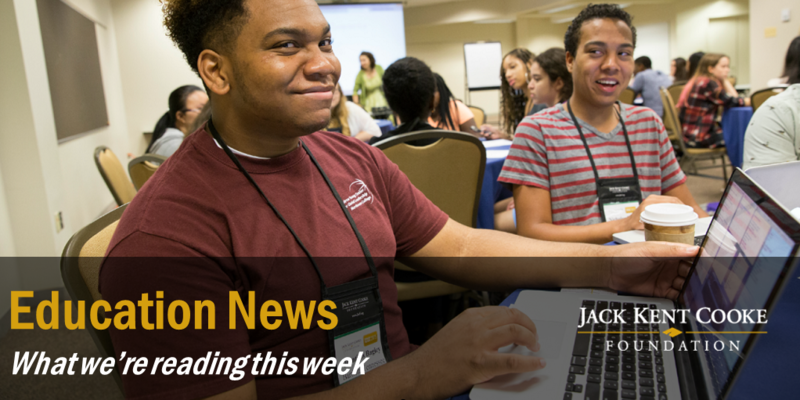 September 3, 2015—Here are the best articles from education news this week. Why are some students more interested and engaged in academic work? Marie Bjerede discusses the relationships between intrinsic motivation and rigor in an article for EdSurge. AASA’s School Administrator focuses on gifted education in its September issue. Jane Clarenbach profiles exemplary programs for closing the Excellence Gap by nurturing underrepresented groups of students. In a separate article, Chester E. Finn and Brandon L. Wright encourage school systems to adopt practices to better serve high-achieving, low-income students. Last week’s headlines on the graduation rates of Pell Grant recipients left out the extent to which the program reduces debt for low-income students, says The Education Trust. This is of additional significance when considering that students with the smallest amounts of debt are more likely to default than students who accumulate larger debts. The New York Times reports that bigger borrowing is usually associated with graduate school and higher earnings. With the Perkins Loan Program set to expire if not renewed by October 1, The Hill discusses the confusion of eliminating the only finanicial risk-sharing student aid program at the same time Congress has been calling for more “skin in the game” from colleges. The College Board released its annual report of SAT scores, which showed some of the historically lowest scores in both math and reading. Inside Higher Ed describes the continued trends of wealthier students scoring higher than those from low-income families, and that of white and Asian students outperforming black and Latino students. A report from the University of Chicago‘s Minority College Cohort Study describes the significant financial distress that well-prepared black and Latino students face when attending college. Researchers included recommendations for colleges and universities to better address this population’s needs. When industrial-age entrepreneurs wanted to encourage competition and change in the educational systems of the day, they invested in founding institutions such as Johns Hopkins, Carnegie Mellon University, Stanford University, and the University of Chicago. TechCrunch encourages a similar spirit amongst contemporary Silicon Valley leaders. Vassar College, the inaugural recipient of the Cooke Prize for Equity in Educational Excellence, was profiled in Marketplace Education for the success of its Transitions program. This pre-orientation initiative guides low-income, first-generation, and veteran students through understanding student services and support available on campus. Today is the final day to support the Cooke Foundation’s proposed panel at SXSWedu. If you haven’t already done so, please consider casting your ballot before 11:59 pm CT.